How we handle weights and sizes for items, SKUs and orders. Some carriers require weights and dimensions so they can calculate the freight charge. We can usually save you entering these again and again. If weights or dimensions are not supplied by your store feed we will flag the order and ask you to enter them. We remember the values for each product title and use them again next time we see that product. Weights can come from a number of places and, if you provide them, we will add up the item weights to calculate the total order weight. Depending on your store type, you may be able to record weights for each of your products. If you have entered weights in your stores then we will import them. If your products are all the same weight, or you have a flat rate agreement with your carrier, you can enter a default weight that will be used for all items. See Force item weight to X (grams) in Settings ⇒ Stores ⇒ (your store) ⇒ Settings. You can force an order to have a particular weight. the Total Weight (Kg) field (to override the calculated value). If an order has only one item, the order will use that item's dimensions. Some stores have product attributes for length, width and height. If you have recorded these we will use them. If your products all have the same dimensions, or you have a flat rate agreement with your carrier, you can enter default dimensions that will be used for all orders. 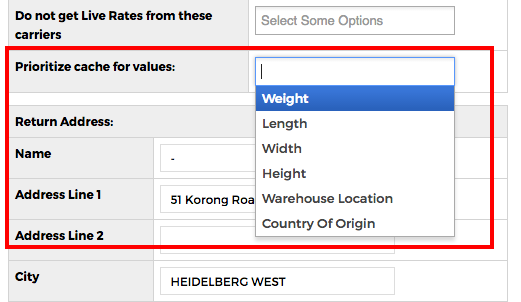 See Default order dimensions in Settings ⇒ Stores ⇒ (your store) ⇒ Settings. You can force an order to have particular dimensions. the Total Order Dimensions (cm) field. You can tell ReadyToShip whether to use imported weights from your store, or saved weights you may have entered directly in ReadyToShip. Navigate to your Store settings (Settings ⇒ Stores) and use the "Prioritize cache for values" field. When this is set we will always use the locally cached version of an attribute unless none has been entered for that item, in which case the imported value will be used.